The system can also be optionally sup- plied with an integral DGPS receiver with surroundings that can be automati- cally annotated with GPS position — providing complete surveys. Control Systems (WECS). The system, which monitors approximately 500 additional channels for shipboard sen- sors and systems, also provides remote control of the vessel's bilge pumps, bal- last tanks, oil transfer pumps and engine room ventilation. SVS/DVS systems have an "open archi- tecture" design, which means all types of computer peripherals can be inter- faced. The self-contained electronic charting systems incorporate a fully marinized Intel Pentium computer and a military specification internal hard drive. The sunlight and daylight view- able screens are precise full-color TFT displays. The software automatically loads charts and accesses positioning data, and automatically finds the best scale chart for the vessel's position. The Euro 100 rudder angle indicator, available from DeHart Marine Electron- ics, offers easy read-out of the rudder angle and adjustable illumination. It is supplied with a sturdy and reliable rud- der sensor, which is splash-waterproof and oil-resistant. Pinwheel Technology. Measuring 6.5- in. and weighing 600 grams, the antenna is compact — making it ideal for portable applications, such as surveying. AM, APCO 25 and other radio services. General Hydrostatics (GHS) from Creative Systems, Inc.
NavCad offers an integrated platform to predict resistance and power, and to determine optimum propeller parameters. With NavCad each aspect of a ship's performance can be evaluated for virtually every type of displacement hull, semi-displacement and planing craft, river barge train, catamaran and auxiliary-powered sailboat. NC-PyrOS from Albacore Research Ltd. from SPAR Associates, Inc. Integrated ship produc- tion for Win95 - WinNT. Link: AutoCAD-13 based 3D struc- tural modeling plus weight & CG. Perception provides planning, scheduling, estimating, purchasing, material inventory con- trol and labor work order manage- ment for the integrated shipyard. Control Rust! • . .fciiit&.V- . I liil • •• . 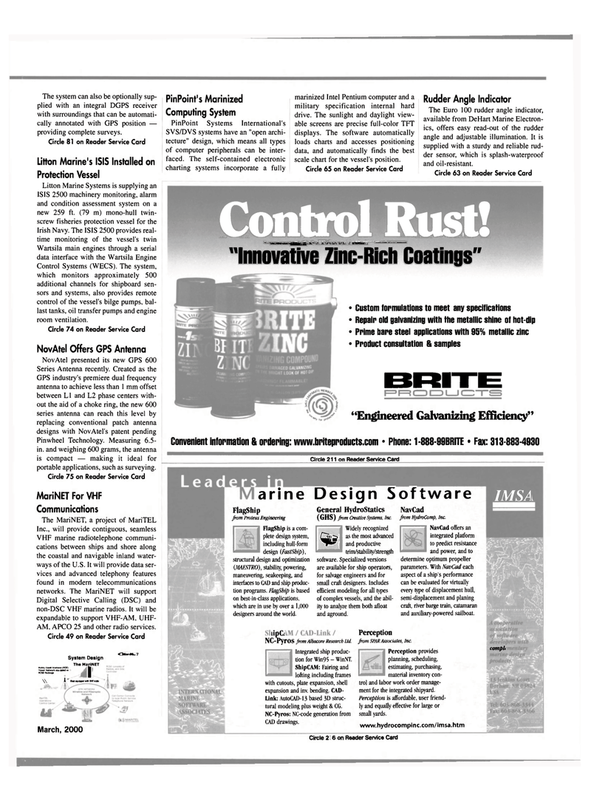 - "Innovative Zinc-Rich Coatings"